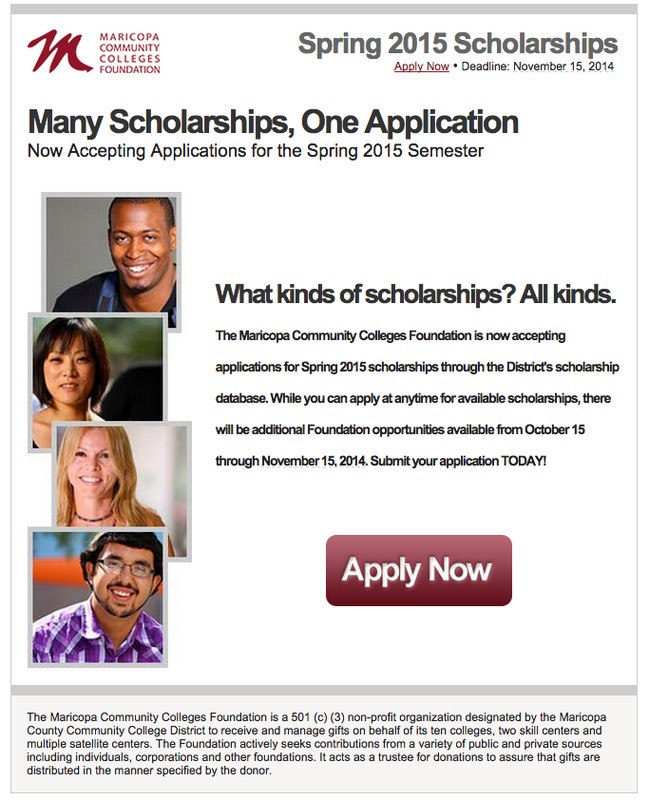 Maricopa Community Colleges Foundation is now accepting applications for Spring 2015. Complete one application for multiple scholarships. Apply now. Applications close November 15th. Maricopa Community Colleges Foundation Scholarships are privately funded and open to all Maricopa Community College students. A Free Application for Federal Student Aid (FAFSA) is not required to apply. Foundation scholarship applications open twice a year. Students are able to create an account and apply for scholarships online during two application periods, once during the Fall semester and once during the Spring semester. An email notification with specific application dates will be sent to students, staff and faculty each term prior to the application period. Foundation scholarship applications are reviewed by Maricopa Community Colleges faculty, staff, scholarship donors and community volunteers. Award and denial notifications are sent via email. Awards are generally posted at the start of each semester. Check the status of your Fall 2014 applications. Volunteer to be a scholarship application reviewer.